Sign. Sealed. Delivered. It's yours! We are the sign solution for road signs, parking signs, and construction signs. We will create a customized sign for your purpose and location. Whether it is down a paved path to your business, your parking lot, or even the announcement of your soon to be construction site. We can help! Let The Sign Studio's professional staff make a custom sign for your specific needs. We have infinite options for your road signs, parking signs, and construction signs because they are all custom made to fit your sign safety needs. Are you on the construction site and you need your sign to be too? We will find our way to you. We will even install your sign on location or make repairs to your sign. Pedestrians will cross, cars will park, hazards will be present. Be prepared for any situation with the help of The Sign Studio. Take care of your property with the appropriate safety sign. Your custom made sign will be ready when you are. Your business and the safety of your surroundings will depend on you. With our expert sign production, it is possible to make safety simply with the highest quality signs on the market today! Regulatory Signs, Health and Safety Signs @ The Sign Studio in LA County - If you are a business owner, you understand that you must provide parking for visitors to your establishment if you are going to generate any kind of traffic at all. While most business storefronts already have some form of parking available, just taking it for granted that everyone will be able to locate a spot for them will just not be good enough. As a matter of fact there are some things that the authorities consider a must if you are going to provide proper parking for your customers. Handicap signs, regulatory signs, Health and Safety signs must all be in place or you may not just miss out on some great business, but you could even be fined a hefty sum. Designated visitor and employee spaces are a must if you are going to be able to handle all the traffic that comes your way, and don't forget to place signs that warn violators that they may just be towed away. No one wants to injure another person for parking in a spot that is not for their use, but let's face it, if there are no parking spaces left, your customers may just go somewhere else. Using handicap signs, regulatory signs, Health and Safety signs are just the beginning of the types of parking signs that are a necessary part of doing business these days, so make sure you have all of yours in place to accommodate the needs of your clients. Welcome to the family! Today, a growing trend is the family restroom. If you are joining in trend at your commercial building, announce it appropriately with a professional sign. Let families know exactly where to go with family restroom signage. Choose the perfect pictograph to let your guests know who is welcome in your restrooms as well as the capacity of your bathroom facility. One toilet? Two toilets? Specify with a family bathroom sign. All are welcome in your commercial family restroom so don't be afraid to say so with a professional posted bathroom sign. Not only are family restrooms unisex, but they often include two or more toilets, a changing table, and enough capacity for a wheelchair. Show your care and concern for families and people with disabilities at your facility. No matter what your guests may need, let them know they are welcome at your one stop, pit stop. These bold, attractive, easy to read bathroom signs are universal and will communicate appropriately, no translations needed. Pick the perfect color to adapt to your decor. Family restroom signs are available in Braille and can be custom made to match your needs. 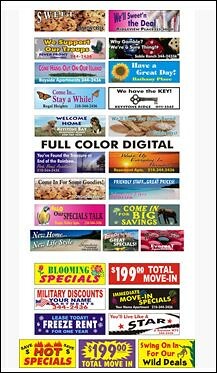 Burbank Sign Company | Looking for Signs or Banners? Look No Further! Need signs? We have signs!!! It is a known fact that a sign will help a business flourish. Huge banners where everyone can see will catch anyones attention. Custom signs that will attract customers stand out for everyones attention. Signs on sign posts are a huge way to help increase sales for your business. Marketing your business with signs is an effective and powerful way to help your business. The question is though..... where would one find a place to create the signs you want? That is where our business comes in! The sign studio are your experts and are here to help your business increase sales. Do you need signs or banners, then we are the experts that you need. Our high quality signs will definitely drive your business. We have signs for indoors/outdoors, illuminated/non illuminated and any size you want. We have the best quality and make everything simple for you, from concept to finish! Stop/Traffic signs, U channel posts and custom signs, we have them all available! Let us design and manufacture your signage while you grow your business. It is a well known fact that first impressions are very important. With our signs and your buisness there will definitely be a lasting impression with all your customers!!! No job is too BIG or too Small for The Sign Studio. We believe that no matter what type of sign is needed for your business it should be custom made to impact your advertising and marketing strategies. Particularly, handicap and ADA signs. The law requires your business to have handicap signs for designated parking spaces, so why not work them to your advantage. Instead of using the same signs everyone else uses let The Sign Studio create one-of-a-kind, cost effective signs that not only satisfy state requirements but at the same time create an impression about your business. Who you are and what your business offers. Let us get to know you, send us your current logo or if you don't have one let us create one for you! Also, we will design handicap parking signs and other ADA handicap signs for inside or outside your business that will be unique, colorful, and eye catching. You will be putting your name out there before they get inside your doors and if you share your parking lot with other businesses these handicap signs will make a lasting impression for perspective customers. The Sign Studio offers a variety of concepts using state-of-the art computer sign-making equipment and offers a variety of signage that will fit your needs and best of all the process is simple. Why not give us a call today or shoot us an email and let us put our marketing expertise to work for you to create handicap parking signs that will work to your benefit and leave a lasting impression. Our acrylic signs with standoffs are durable and lightweight, while giving your visual message an air of sophistication and elegance. Crystal vinyl signs can give your visuals that "etched in glass" look, while our custom wallpaper is strong and flame resistant. Our more extensive sign solutions can include custom ceiling tiling patterns that give your office or facility an air of open space. Imagine it...we can do it! Bring us your idea and we will transform it into a striking, yet affordable, visual display. Call today to speak with one of our expert signage consultants. Burbank Sign Company | Signs & Banners are a WIN Win!!!!! Signs and banners are an efficient way to advertise any type of business with lasting results. A sign should be the spotlight of your place of business as this may be the only opportunity to sell your product. In today's competitive marketplace signs should attract the attention of the consumer and invite them to buy. An advertisement with a distinct and eye catching design or logo can produce a high volume of customers. Signs and banners are an investment that will pay for itself. Extra income can be generated by strategically marketing your brand. Our business is to help you create the best design for your specific advertising needs. At The Sign Studio we have full color digital graphics to enhance the symbol, logo or emblem you may want to use in creating your banner or sign. A banner is large but portable; it can be moved from a doorway, window or entrance and be placed where you decide it attracts the most attention. A window sign is more of a permanent way of getting the same outcome. If your business does not have the space for a large banner or you just don't want the permanence of a window sign; a site sign or vehicle sign could be the answer. These signs are removable and portable, just smaller in scale. We can still design a logo that is unique for your business. Whether it's a restaurant, daycare, doctor's office, grocery store or even a one- time event we will make sure you are seen. Call us today for a consultation and quote! ADA and Title 24 Restroom Signs - Any Questions? 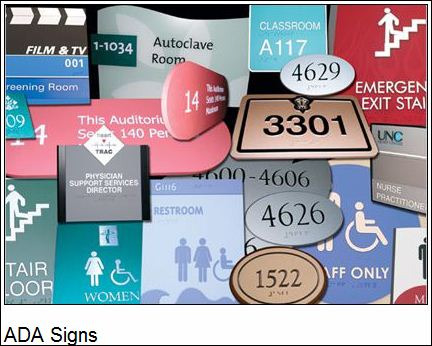 The Sign Studio in LA County is your information resource for ADA and Title 24 restroom signs. We realize regulations are difficult to understand and follow, that's why we do the work for you! If you have questions, we have the answers. We will provide you with high quality, custom-designed signs for use indoors or outdoors resolving your questions and concerns about compliance with ISA standards and ADA/Title 24 regulations. You can trust The Sign Studio in LA County to answer your ADA/Title 24 restroom sign questions and provide professional service, installation and repair. We exist to help facilities and businesses requiring assistance with sign design and placement. We can research your questions and concerns. We are confident we can meet and surpass your expectations with our friendly customer service and knowledgeable team. Request a quote today at http://www.thesignstudioonline.com/quote/. What is the first thing most customers notice? Signs! Strategically placed, uniquely branded, and carefully designed signs can add traffic and revenue to your business. Effective signage can be the key to growing your business and grabbing a larger chunk of the market. A sign's visibility: The sign and message should be readable from a customary viewing distance - consider whether most of your potential clients will view the sign as a pedestrian or while traveling in a car. This will determine where a signs is placed, where on the sign the graphics and text are located, and what size your sign needs to be. A sign's readability: Will they be able to easily view and understand your sign? The size of the graphics and text on a sign is also important. Can your customer read what is on your sign? If you don't have room for large letters you should consider using light colored letters on a dark background. This will provide a high contrast for easy viewing. A sign's aesthetic: Is your sign pleasing to look at? Customers tend to be drawn to signs with pictures or graphics and producing a sign in full color is even more beneficial. Using a border on your sign design will help frame your message and can help provide a clear, concise message. ADA Signs / Braille Signs / Handicap Signs / Restroom Signs and much much more! If you're in the market for any type of signage, come visit The Sign Studio. They have an extensive selection of high quality signage at great prices. Whether you need ADA, Braille, handicap, or restroom signs for an indoor application or you need something larger like banners, A-frames, or even custom work, The Sign Studio can meet your needs. The Sign Studio is really a one stop sign company from concept to finish and from and is there for any project, big or small. From the moment you walk in, the person answering your questions and taking your order is also the person who will be working on your project, which minimalizes the risk of time consuming and costly mistakes. They can handle some of the trickiest installations you can throw at them and are fully licensed and insured. For over 20 years, The Sign Studio has been the place for custom graphics and logos. All work is done in house and they have a friendly and experienced staff that is capable of handling all aspects of your sign project including design, install, or repair. Check out The Sign Studio at www.thesignstudioonline.com today! You won't be disappointed with the selection of high quality, custom made signage that The Sign Studio has to offer. Whether you need small bathroom signs or large custom made wraps or banners, The Sign Studio is your ultimate choice for any sign related project. Burbank Sign Company | Custom Signs And Banners Of All Kinds! A business with no sign is a sign of no business! This is the mantra behind the success of The Sign Studio. Signs increase traffic and lead to higher sales and success for businesses. The Sign Studio not only offers custom designed signs and banners, but sign repair and installation, sign removal and even sign site surveys to ensure your sign will get the most exposure. The Sign Studio will even design a logo for the sign to stand out and represent the company in its brightest light. The highest technology is used to create these high impact, cost effective signs to boost business. We produce indoor and outdoor signs as well as illuminated, non-illuminated and even banners of any size. The team at The Sign Studio promises to make your journey to a successful business easy. We begin by developing a cost effective design and logo. Each client is considered a friend in this journey. As the projects blossom from paper to reality each sign is fabricated with the highest technology possible. Signs are then installed at your location of choice. We are all about the highest comfort and guarantee to our customers. If you have any questions or need assistance with anything, please give us a call at The Sign Studio - (818) 843-9200 or send us an e-mail at info@signstudiola.com. ADA Signs / Braille Signs / Handicap Signs / Restroom Signs & More!! Three Tips for Designing an Effective Sign . What is the first thing most customers notice? Signs! Strategically placed, uniquely branded, and carefully designed signs can add traffic and revenue to your business. Effective signage can be the key to growing your business and grabbing a larger chunk of the market. Are You Looking For Title 24 and ADA Restroom Signs? Try Banners and Signs - Efficient & Cost Effective Way To Advertise. Are you Looking For Custom ADA Or Handicap Signs? Looking for Custom Handicapped Signage?